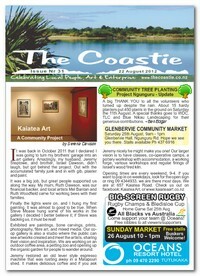 History: The Coastie was first published in January 2012 as a weekly community publication, delivered free to over 1150 local households and business premises in Whangarei's Glenbervie, Ngunguru, Tutukaka, Matapouri, Sandy Bay and Kaiatea areas. Every week during the year, The Coastie captured a unique snippet of life in the Tutukaka Coast area. Due to changing circumstances, we stopped publishing our weekly edition in September 2017 with issue #251 to concentrate solely on producing our Magazine Edition. Produced as a full colour, 40+ page print magazine, it features local information like Mal Egginton's now famous perennial Local Beach Guide, local walks guide, Tutukaka Coast local map, stunning local photography, timely relevant topics and business advertising. Our current distribution is 8000 copies. 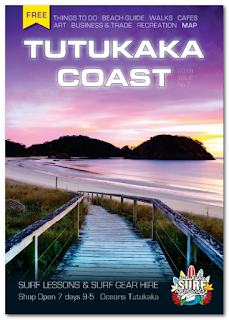 The Coastie Magazine Editions are available FREE to the public from most local Tutukaka Coast business premises plus selected Whangarei locations including the two official information sites in Whangarei City. Both the printed Coastie Magazine and this website are produced and published by Dimitri Frost & Kate Broughton of Ngunguru, in collaboration with local content contributors. Production is 100% financed through advertising revenue. Calders Design & Print in Whangarei are printing for us. The general tone is always inspired by our motto: "Celebrating local people, Art and Enterprise". Ngunguru Library, Oceans Resort Tutukaka and Salt Air Cafe in Ngunguru.